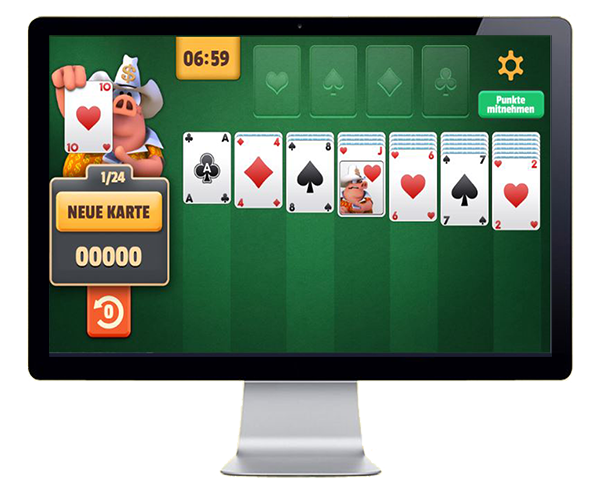 Are you able to help Jack Pot, our famous pig from Texas, to clear the entire card field in this version of Solitaire? In order to do this, you need to place the cards on top of the ones that are one higher value in a different color. But it’s not as easy as it seems, because every time you hesitate going through the stack more than one time, you will lose points. Have fun with Jack Pot in this classic card game! Stack the cards on top of each order as long as it is one higher in value and in a different color suit. Your goal is to sort the cards by rank (from Ace to King) at the top of the game field. But be careful because there are some penalties if you hesitate going through the stack more than once.